From May to September of 2018, Zaandam will be cruising icy Alaska. These 14 night roundtrip cruises departing from Seattle visit Juneau, Icy Strait Point, Homer and Sitka to name a few. From April to October of 2019, Zaandam will be migrating to the other side of the American continent to complete cruises exploring the landscapes and scenery of Canada and New England. Seven night cruises from Boston to Montreal (or vice versa) will introduce you to Bar Harbor, Halifax, Sydney, Charlottetown and Quebec City. As the weather warms in the southern hemisphere, Zaandam heads to the South American continent. A number of Zaandam‘s itinerary loop under the continent via Cape Horn, allowing you to experience the scenery and wildlife that avails the Antarctic circle. If Antarctica is part of your wish list, make sure to check out Zaandam‘s cruises that cruise the Antarctic Circle (weather permitting). 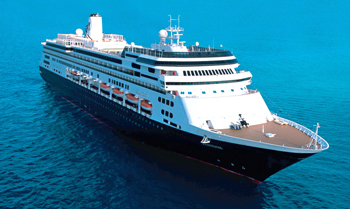 View all Zaandam cruises, view a selection of Holland America cruise deals, or view more options for Holland America cruises. Designed to carry fewer guests while providing more space for maximum comfort, Zaandam is a prize in the mid-size ship category. On the musically themed Zaandam, you’ll find musical instruments such as Bill Clinton’s saxophone and signed guitars from Queen, Iggy Pop, Eric Clapton and the Rolling Stones throughout the ship. In her soaring three-story atrium: a Baroque-style Dutch pipe organ, inspired by the traditional barrel organs still found on the streets of The Netherlands. While on-board, choose from an array of onboard activities that allow you to pursue new interests or relax and rejuvenate. Enjoy onboard cooking shows and hands-on workshops in partnership with America’s Test Kitchen. The Greenhouse Spa & Salon offers spa treatments, a thermal pool and lounge and salon services. Our fully equipped Fitness Center includes state-of-the-art cardio and weight machines, as well as classes in Yoga, Pilates, indoor cycling and more. On deck enjoy two outdoor pools, along with basketball and practice tennis courts. Due to the tremendous popularity of the B.B. King’s Blues Club on Eurodam, Holland America Line is pleased to welcome B.B. King’s Blues Club to the Westerdam, Zuiderdam, Noordam, and Nieuw Amsterdam. Join these world-class musicians as they create a dynamic energy that will move you to sing and dance along. Every day aboard a Holland America cruise ship brings a wealth of cruise activities and indulgences, along with the freedom to partake in as many – or as few – as you please. It’s an opportunity to try something new that surprises you, every day. Dabble, discover, daydream – do everything, or do nothing at all. Whether you want to workout in the Fitness Center, learn yoga, pamper yourself with a massage and spa treatment, or listen to music and check your email in the Explorations Cafe, there’s a perfect onboard activity for everyone. Take a class in our professionally staffed Fitness Center* equipped with the latest cardio and weight machines. On deck are basketball and volleyball courts and two refreshing pools. Pinnacle Grill: This intimate reservations-only venue offers an elegant, sophisticated dining experience. Featuring premium Sterling Silver beef, inspired seafood dishes and many select wines rated “Excellent” by Wine Spectator – as well as distinctive Bvlgari china, Riedel stemware and Frette linens. Canaletto Restaurant: Named for a famous 18th-century Venetian artist, Canaletto is your destination onboard for an intimate Italian dinner. The evening begins with the chefs selection of antipasti with a taste of the delicious fare and personal, polished service to follow. Dive-In: The perfect poolside spot for a grilled burger, gourmet hot dog or savory fries. Lido Market: provides a fresh, new approach to casual dining for breakfast, lunch or dinner, with a panoramic view of the sea. A modern marketplace with different themed stations, the Lido offers a curated selection of delicious options to grab on the go or to have quickly made to order. Sel de Mer: is an intimate seafood brasserie offering a contemporary twist on French seafood classics, with à la carte dishes ranging from fresh oysters to salt-crusted whole fish to bouillabaisse. Vista Dining Room: Features impeccable service and an extensive wine list. Five-course menus include continental cuisine, vegetarian and low-carb options.